The mountains of money that circulate through UEFA, FIFA and the elite clubs of Europe and beyond, are difficult to comprehend. But what is clear is that football fans, at least in the top tiers, often fail to reap any of these rewards. Instead they are disregarded consumers, expected to pay ever-increasing ticket prices or simply to go without, whilst teams reap the TV money of Sky and BT etc, plus the endless litany of sponsorship deals. Some football clubs seem so preoccupied with ostentatious displays of their wealth, that we can only assume that they don't just take the support of fans for granted, but frankly they don't care either way. As far as they are concerned, if real fans can't afford to attend matches, there will always be millions of tourists who will pay for such an event in the same way as going to the theatre. PSG have been building up to this for a while; in recent years they have done their best to undermine Ligue 1 as a credible competition, and despite 4 quarter-finals in the past 5 seasons, they continue to flatter to deceive in the Champions League. 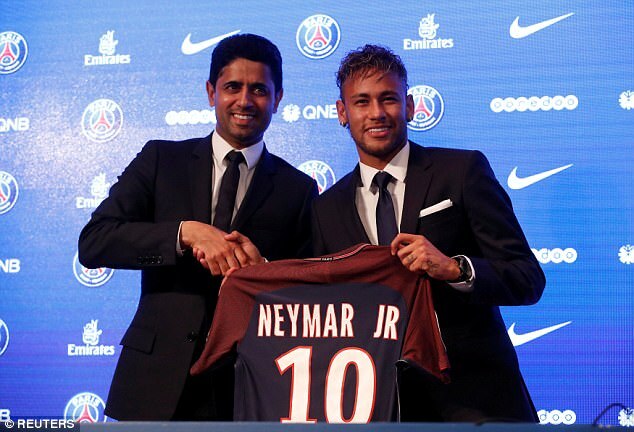 In their quest to become the biggest football club in the world, the owners of PSG, Oryx Qatar Sports Investments, have now staked everything on the most outrageous transfer in football history. In fairness, PSG are not the 1st club to try this tactic, when Roman Abramovich purchased Chelsea, the club went on a historic spending spree. In that first season as owner (2003/04), Chelsea spent a combined £153.45M whilst recouping a grand total of £100,000, when they sold Leon Knight to Brighton and Hove Albion! After the arrival of José Mourinho, the 2004/05 season saw an outlay of £56.85M, with a return of £11.7M. However, £6.5M of this was for the sale of Scott Parker to Newcastle Utd, less than 17 months after they'd paid Charlton Athletic £10M for him. A similarly nonchalant approach to finances was demonstrated by Real Madrid in the summer of 2009. Barcelona had just reclaimed the La Liga title, and Los Blancos were keen to make a statement of intent, this led to the then record transfer purchase of Cristiano Ronaldo, for £80M. Kaka, Benzema, Alvaro Arbeloa and Xabi Alonso were also drafted in as the club splashed out a whopping £194.5M. They did make sales amounting to £31.4M, but this still left an almighty deficit, and Barcelona went on to win the next 2 title races anyway. Thanks to their pursuit of Neymar, and a raising of the highest transfer fee from £89M to £200M, PSG have become the lightning rod for everyone worried about how money is distorting the landscape of football. The question now on the lips of many people is, will the UEFA 'Financial Fair Play' regulations (FFP) ever be useful? As far as they stand, a football club cannot spend anything over €30M more than they earn, and, in principle, this sounds like it should act as some sort of curb on spiralling debts, and investments by owners. However, PSG do not seem remotely concerned that they are in danger of flouting the FFP rules by signing Neymar for £200M. In truth, it's highly unrealistic to expect this deal to make up for the financial shortfall in the income of PSG, yes there will be commercial revenues to be taken advantage of, but the numbers remain dubious at best. In the meantime, UEFA are impotent, they stated that they can't block transfers but that there will be sanctions if FFP is not adhered to. Fair enough, but the suspicion remains that such sanctions are not a big enough deterrent, and that there are ways and means of restructuring expenditure to keep within the imposed limitations. In other words, FFP is more likely to benefit rich accountants than to improve the 'overall financial health of European club football'. Another real concern is that this transfer isn't just ground-breaking as a figure, but that it will inevitably shift the whole complexion of the transfer market. The press has heard from Mourinho, Arsène Wenger and Jürgen Klopp, and each of them has said that the knock-on effect of Neymar's move will be an inflation of other prices, there is no going back. Barcelona have £200M to play with, and one assumes that to get over the shock of losing their Brazilian striker, they'll feel compelled to bring in their own new signings. But any club they approach now will expect to make a handsome profit, it's obvious that Barcelona will struggle not to pay more for a player than they would have done before their cash windfall. One more factor in all of this, goes back to the PSG owners once again. It has been speculated that whilst Oryx Qatar Sports Investments genuinely care about making PSG the biggest club in football, their motivations are also political. Qatar is currently embroiled in diplomatic disputes with Saudi Arabia, Egypt, Bahrain and the UAE, all of whom accuse the Gulf state of sponsoring terrorism, something that Doha vehemently denies. With the huge transfer of Neymar, there are suspicions that this publicity is a propaganda statement to the world and those countries opposing Qatar. -Allegations of corruption in bidding process. -The conditions and rights of construction workers. -Logistical nightmare of holding the tournament between November 21 & December 18, due to summer temperatures being up to 50°C. -Cultural issues, particularly those surrounding drinking alcohol in public and attitude of Qatar towards LGBT community. With the ownership of PSG being what it is, and the football world already having plenty of grievances with Qatar, the transfer of Neymar could be viewed as a final, pompously arrogant act by a state that had never previously demonstrated any love for the beautiful game.